PARIS (Reuters) - French and Malian forces have killed about 10 suspected Islamist fighters during an operation in northern Mali's mountainous Adrar des Ifoghas region, French army spokesman Gilles Jaron said on Thursday. Confirming comments made by French Defence Minister Jean-Yves Le Drian earlier on Thursday, armed forces spokesman Gilles Jaron said the militants had been spotted by a drone. Air units were immediately called in to intervene, he said. A French-led offensive in January 2013 drove out Islamist militants who had seized control of northern Mali. Small groups of fighters loyal to Islamist groups including the Movement for Unity and Jihad in West Africa and al Qaeda in the Maghreb still operate in the desert region, carrying out periodic attacks. "We discovered about a dozen jihadists that were handling rocket launchers around a weapons' cache in the Adrar," Le Drian told Le Figaro, describing the incident which took place on Tuesday night. According to the newspaper it was one of the first successful missions by U.S.-made Reaper unarmed surveillance drones, which Paris bought at the end of last year to replace its EADS-made Harfang drones. "This shows that there are a number of jihadist networks that are seeking to hide out," Jaron said. 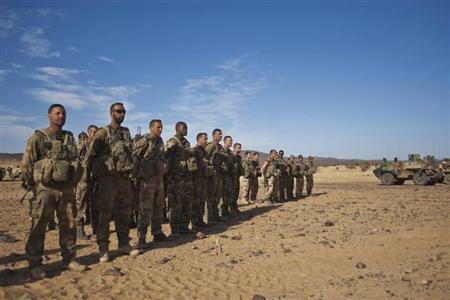 France is winding down its troop presence in Mali to 1,000 soldiers as a 12,000-strong U.N. mission comes into force. However, Paris, which now has about 1,600 troops in Mali has said it will redeploy its forces across the region to counter Islamist militancy.